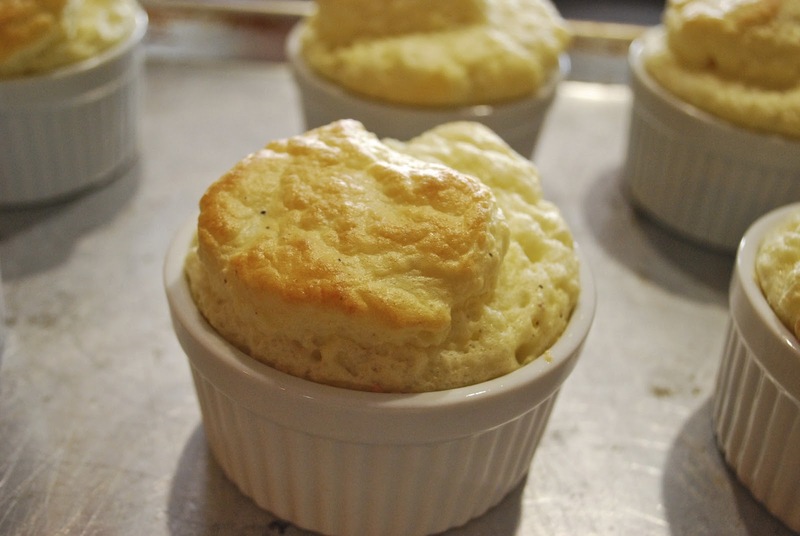 These souffles are beautiful and savory. They are a nice addition to any meal. To prepare souffles, coat each of 6 ( 8 oz) ramekins with cooking spray. Sprinkle each ramekin with 1 tsp. Parmesan cheese and tilt to coat. Combine flour and the next three ingredients in a small saucepan. Gradually add milk and white wine, stirring with a whisk until smooth. Cook 3-4 minutes or until thick and bubbly. Remove from heat. Add salt and Swiss cheese, Stir until cheese melts. Spoon mixture into a large bowl and let stand for 5 minutes. Stir in egg yolks. Place egg whites in a large mixing bowl. Beat at high speed until medium peaks form. Gently stir one quarter of egg whites into yolk mixture; gently fold in remaining egg whites. Spoon into prepared ramekins. Place dishes on a baking sheet and place in the oven. Immediately reduce oven temperature to 375. Bake 17 minutes or until puffed and golden.